Vanessa’s friends and the whole shopping scene. Hannah takes a job with her Uncle’s company supposedly to earn money for her continued education in New Guinea. Soon her coworkers have her spending more money than she has, getting a credit card, and buying expensive clothes she neither needs or can afford. She becomes obsessed with fitting in with the crowd. She seems to have left her faith as well as her Bible behind in New Guinea as she strives to fit in with the other wealthy kids – living for the moment. Hannah is soon finds herself head over heels in debt and doesn’t know how to cope with her situation. A must read to learn how Hannah solves her debt problem and returns to her faith. Did she come to recognize what she valued most? Did she learn that all that glitters is not gold? 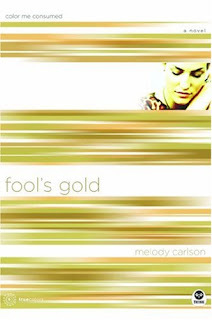 Melody Carlson has a excellent command of the minds of teenagers, especially the rich, and what influence peers have on each other. Highly recommended for teenagers and parents. You will become a fan of Ms. Carlson.